Visitors to Undersoul, an exhibition of Jay DeFeo’s post-1970 works at the San Jose Museum of Art, may reasonably wonder about a large painting called Firesign (1984) that serves as the show’s centerpiece. It contains two things not typically seen in the same canvas: frenzied gestural marks and hard-edged geometric forms. The first is a hallmark of Abstract Expressionism, the second an emblem of Constructivism. 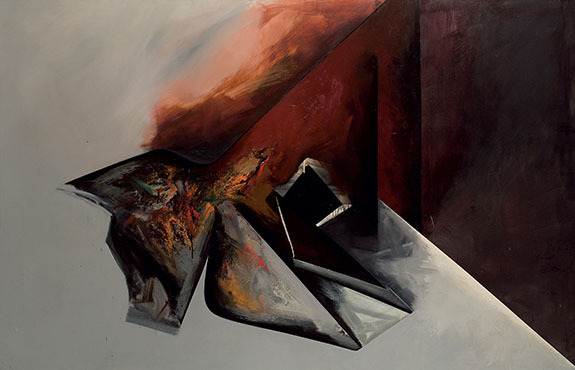 And while we know that DeFeo, early on, aligned herself with Abstract Expressionism (she greatly admired Franz Kline), and that architecture was a longstanding interest, you have to ask: By what leap of imagination and/or logic did the artist unite these two seemingly disparate impulses? everything in her midst (studio detritus, broken crockery, hand tools, a tripod, household appliances, plants, beach scenes, her own dentures) and transforming them. She sliced up prints and reassembled them into collages. 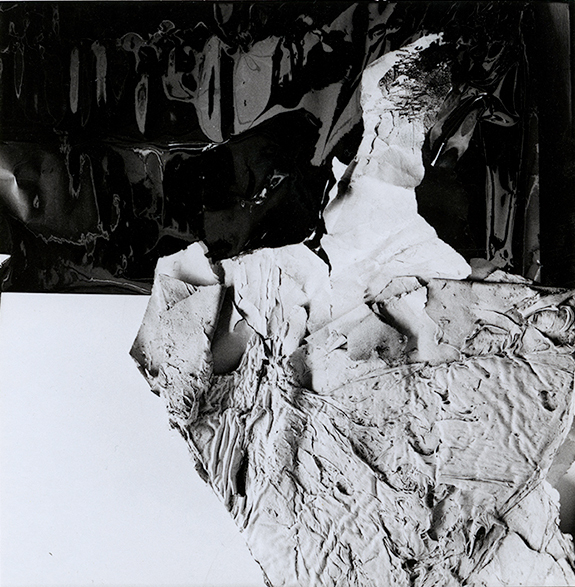 She created photogram-like compositions on a Xerox machine. 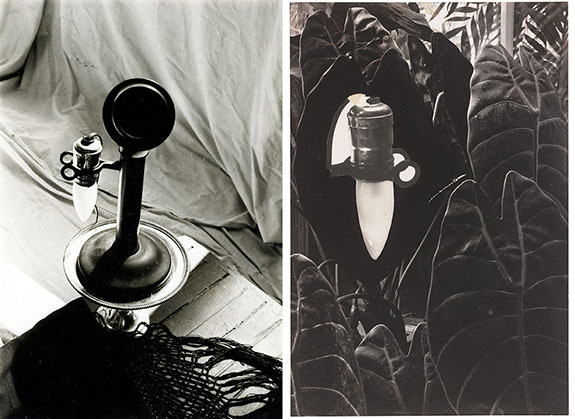 And, most tantalizingly, she staged set-up photos: elaborate Surrealist-like constructions that embodied what Andre Breton called the “magical circumstantial,” meaning the use of found objects to visualize unconscious desires. Through a combination of mechanical and manual image making, DeFeo did exactly that, assembling a library of recursive shapes that would serve as thematic fuel for the drawings and paintings she would make until her death in 1989 at age 60. Her process, more than the end products, is the focus of this exhibition. From 1972 onward, she made thousands of photos. She never intended to show them; they were, for the most part — though not always — studies for things to come; and for that reason she left them untitled. That trove has since become a curatorial gold mine. It’s been the subject of three recent exhibitions at the Hosfelt Gallery, as well as a major sub-theme of a 2012 career retrospective at SFMOMA. Undersoul, which features many works never before published or seen in public, is the latest chapter of what will likely be an ongoing inquiry into how photography informed everything DeFeo did in the years following The Rose – the two-ton painting/opus that consumed eight years (1958-66) of her life and left her, at its completion, physically and emotionally drained. Four years passed during which she made no work. Her subsequent discovery and embrace of photography reinvigorated her career and taught her to see anew. Organized by SJMA curators Lauren Schell Dickens and Kathryn Wade, Undersoul includes 45 works arrayed in clusters that illustrate the artist’s fluid and highly intuitive work process. Drawn primarily from the artist’s estate, the works encompass seven different series and show a progression of ideas and interests, few of which unfold linearly. Forms found in one grouping pop up unexpectedly in others, oftentimes months or years apart. The transformations are often stunning. At the beginning of the show, for example, you’ll find a 1972 shot of a stream cutting a path through sand at the ocean’s edge, a magnificent study in tone and texture. It could easily stand alone, as could many other images in the exhibition. DeFeo, however, rarely left anything alone; her inclination was to revise serially — adding, subtracting, modifying at every juncture. From this picture she cropped two segments that read as mirror-image halves of a fossilized invertebrate, replete with what appear to be eye sockets, drawn microscopically in ink. Had the original and its derivation not been displayed in close proximity, I’d have never connected the two. Similar conjunctions ricochet throughout the room. One the most arresting begins with a deadpan shot of a headless bust. It reappears substantially altered in a nearby photo collage with an eye-shaped (negative space) cut out at the center. It turns up again as a “positive” image in a photo collage depicting a bird whose hand-draw features are rendered in almost Audubon-like detail. The fragment stares out from inside a sheath of “feathers” looking uncannily like an actual eyeball. In a nearby set-up photo built around a broken bowl, what looks like a larger version of the fragment reappears, looking like a puddle of spent motor oil. the artist placed a light bulb into the handset cradle. 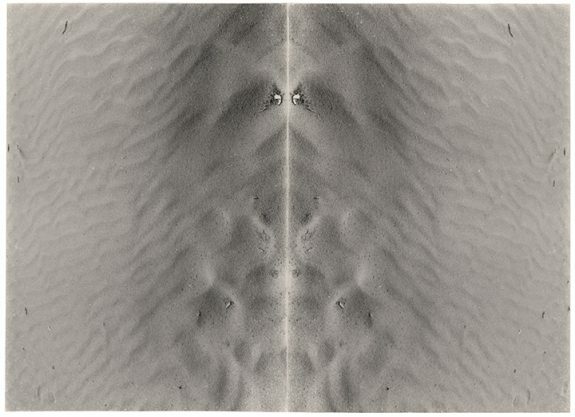 From that image she extracted the bulb and inserted it into a shot of elephant ear leaves, forming a sly reference to Angels, a series of life-sized photograms that Conner, in collaboration, with Edmund Shea, made using his own body in the mid-1970s. 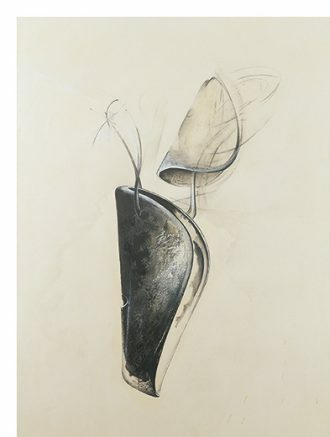 Untitled (Shoetree series), 1977, acrylic, charcoal, ink, grease pencil and graphite on paper, 39 3/4 x 30 1/4"
onto the painted paper. It reads less like a depiction of the actual object than as a cosmic body, a planet circled by rings. Not everything in the exhibition traces the path by which DeFeo turned studies into finished drawings and paintings. 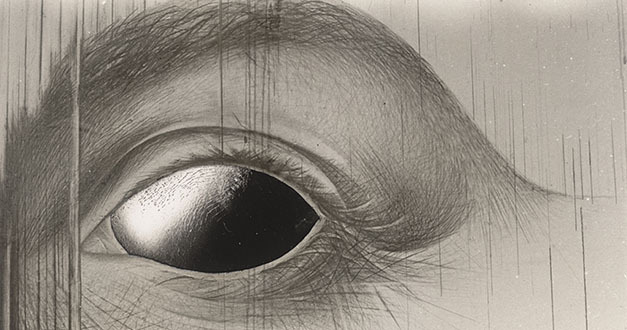 Many of the works are exercises in pure photographic seeing, something DeFeo excelled at. One image from 1971 shows a chunk of cauliflower set inside a compote platter backed by a mirror. It may remind you of the concrete “Dumballs” David Ireland arranged in a similar fashion. Another image depicts floating lily pads. In this, water reflects what appears to be a tile roof, but distortions on the wind-ruffled surface make any such assessment speculative. Other photos are completely inscrutable. One from 1973 shows a series of interlocking portals that narrow to a gleaming vanishing point. Or so I thought. I later learned that the picture is of a mirror reflecting a bathroom wall covered in aluminum foil. Another photo of what I took to be large chunk of rotting cardboard turned out to be remnants of a work on paper (The Estocada, 1965) that DeFeo abandoned when she left the Fillmore Street flat where she made The Rose. She salvaged and stored the pieces under her bed, where they remained for nine years before being repurposed as a new work called Tuxedo Junction (1974), now in the collection of the Fine Arts Museums of San Francisco. If there’s a flaw in this exhibit, it’s the short shrift given to DeFeo’s experiments with a copy machine. They rank among the artist’s most fascination creations. In these, she arranged objects on a platen, recorded images and modified them as quickly as her imagination dictated, with shifts in tonal value making two-dimensional objects appear sculptural. Here we get just two examples, neither of which adequately demonstrates the inventiveness that made earlier exhibits of this material so breathtaking. That could well be the starting point for another dive into a trove whose treasures seem inexhaustibly rich. “Undersoul: Jay DeFeo” @ San Jose Museum of Art through July 7, 2019. 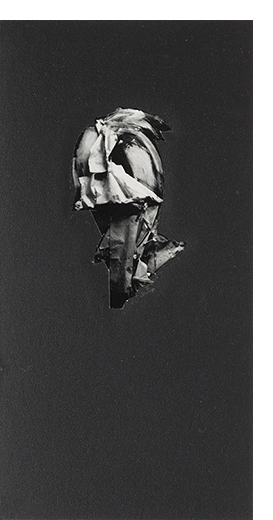 Images © 2019 The Jay DeFeo Foundation/Artists Rights Society/ARS, New York.